Hey party peeps! Do you have a tween or teenage boy who wants a basketball party? Well, tweens and teens can be THE HARDEST to plan a party for. 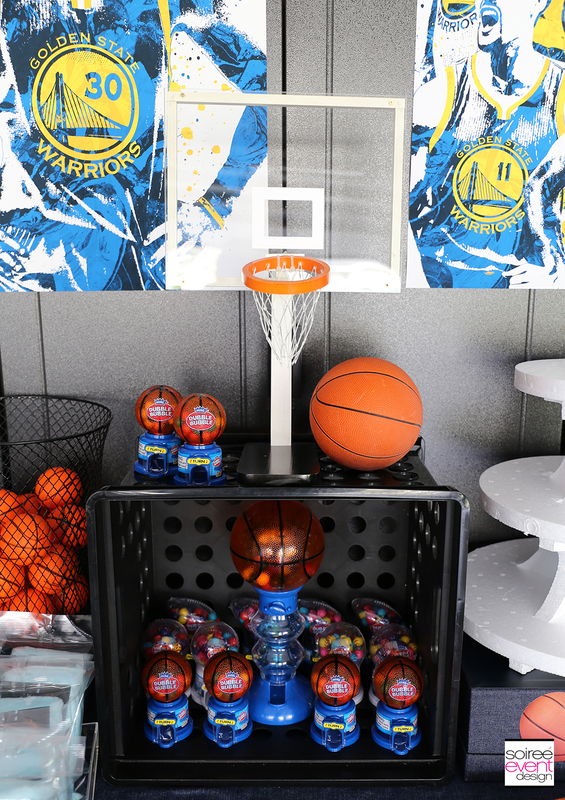 Check out today’s post full of BASKETBALL PARTY IDEAS to get your party planning started! This post is sponsored by Oriental Trading. They have lots of basketball party supplies to choose from. Check out Oriental Trading for some of the items I used for this party. Teens and tweens just want to hang out with their friends. Create a cool hangout space by transforming an area of your house. For this party, we transformed the garage into a cool sports lounge. How cool is this! We also transformed their mud-room area in the garage into a locker room. The blue bags hanging on the hooks and basketballs were there for each guest to take home. 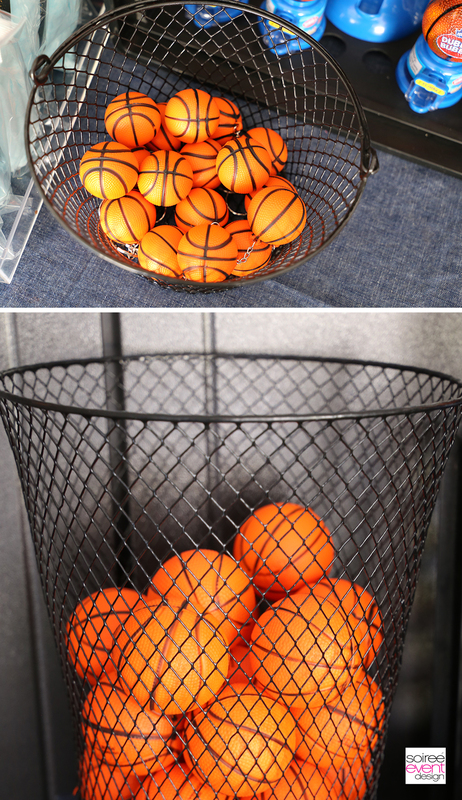 Use plenty of basketballs too all around the party space. These can be given to guest’s when they leave as a cool party favor! GIRLFRIEND TIP: When transforming an empty space like a garage, rent lounge furniture from a local rental company to create a lounge-like look. These two leather couches and side tables were all rented. Best thing…they deliver and pick up! FEATURE THE GUEST’S FAVORITE TEAM! Find out your guest of honor’s favorite basketball team then use the team’s colors to decorate the space. 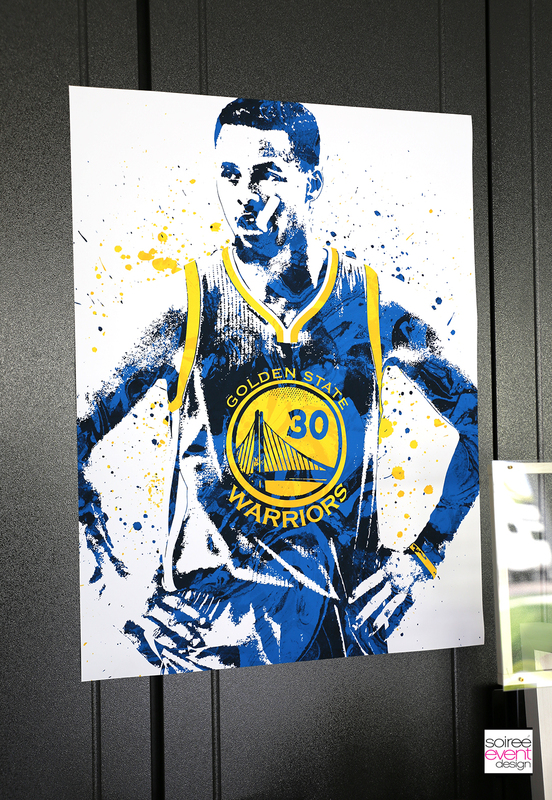 You can also decorate with posters featuring your guest’s favorite team and players! Here the boy’s favorite team was the Golden State Warriors. They hung these posters in their rooms after the party. Teens and tweens love to see their names displayed in their party space. 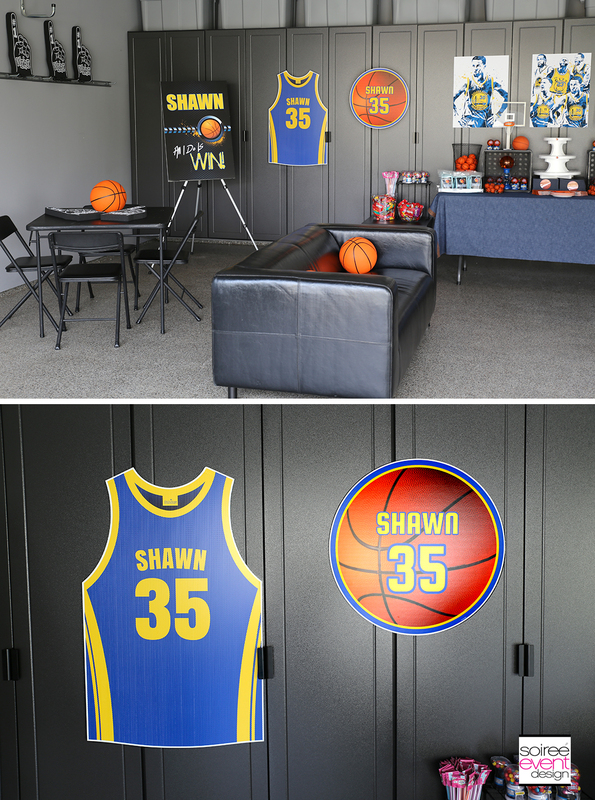 Decorate with foam cutouts of basketballs and jerseys in their team’s favorite colors and their favorite player’s number. Use personalized party printables also to decorate. 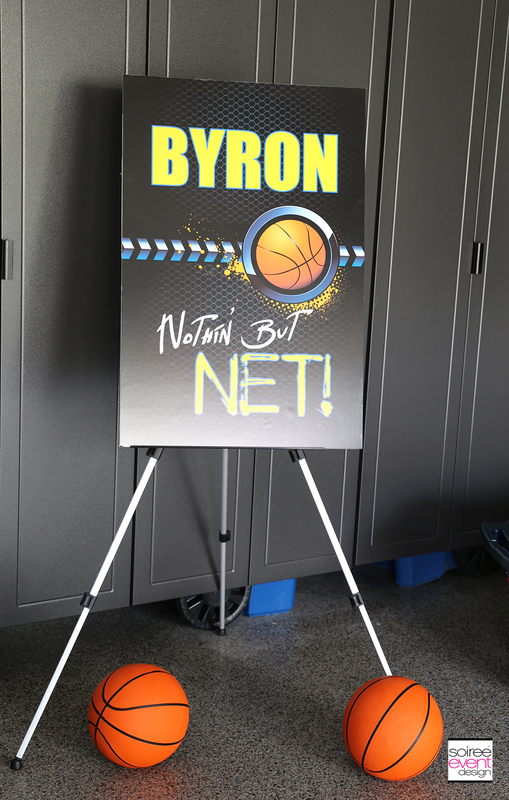 Here I designed these basketball posters personalized with each boy’s name on them to decorate the space. SET UP A SNACK BAR! Set up a basketball themed snack bar as a focal point of the party space. Use the posters as a backdrop above the table for a cool look. Whip up easy finger foods your guests will enjoy like these Cheez-It crusted meatballs. They are easy to make and kids love them served along with dipping sauces. Check out my Cheez-It Meatball recipe. 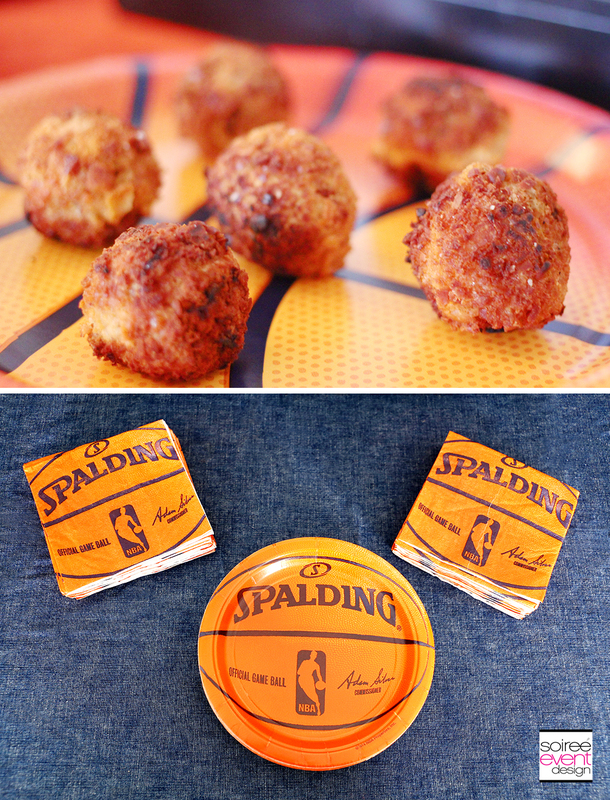 SEND GUESTS HOME WITH BASKETBALL PARTY FAVORS! In addition to the full-size basketballs and canvas bags for each guest, I used wire containers to hold mini basketball stress balls and basketball keychain party favors for each guest to take home too. SET UP A PHOTO BOOTH! Teens and tweens love taking photos! They especially love using photo props. 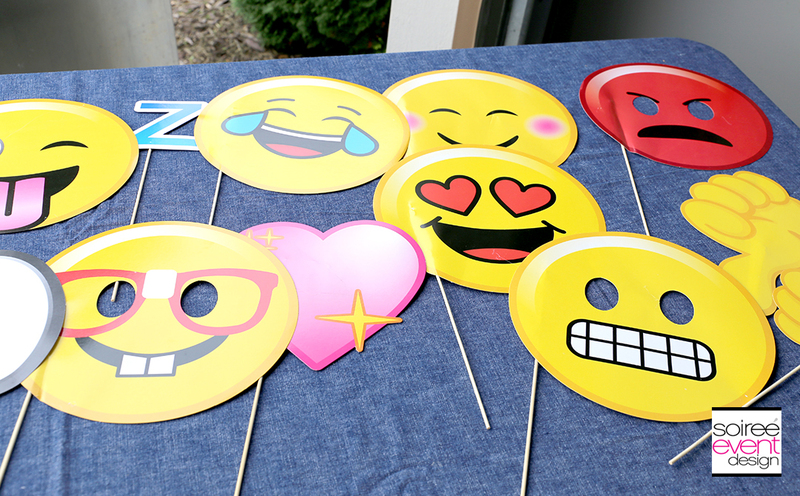 Set up a backdrop on a backdrop stand and place these foam fingers and emoji face prop sticks nearby and watch as the kids have a ball posing and taking photos! – How to Set Up a Candy Buffet & How Much Does it Cost? Be sure to SUBSCRIBE to my blog so you can get all my blog posts delivered right to your email’s inbox so you won’t miss a thing! Subscribing is easy! Just enter your email address in the above right corner of this page and be sure to confirm your email once you get our confirmation to your inbox! That’s it! AND…you’ll get a code for 10% off your next order in our shop. YUP…GOTTA LOVE THAT! CLICK HERE to check out my PINTEREST BOARD full of recipes, parties, home decor, DIY projects and more! My son would love this. He’s a huge basketball fan, and this would blow his mind. How do I get invited to one of your parties? This would be an amazing party! It looks like so much fun. My oldest LOVES basketball! This would be the coolest party! I could see my tween girl loving this. I love all the decor. My grandson would go nuts over having a basketball party. He’s a teen and loves the sports. You have some of the cutest ideas every and I’m going to borrow some of them. What a fun party theme for anyone who loves basketball. I really like the personalized items. This is a cool party.It just needs a basketball hoop so the kids cool play a game. Oh wow, I can only imagine how I would love these kinds of party even just for me but I’m sure it would be any teenagers dream. Wow, this was so well planned and executed! All of the decor, the food, and the party space look stunning! What a cool idea. Very festive. Looks great. What fun the boys will have. These are all such adorable ideas! Cheez it meatballs sound like an amazing idea. My son plays basketball. He would love this party, it’s right up his alley! Those cookies are awesome! This is such a cute idea! My son really love basketball and I know he would flip for this! This age is such a hard time to party plan for! This is gorgeous and matches a fun theme. Looks fun! My son would love that! He’s a huge basketball fan! Such a great set up! Oh my gosh, that is great! I love those decorations. I will definitely have to keep this in mind for when my son gets a bit older. These are fabulous ideas for anyone who loves sports! I love the decoration ideas! This is fabulous! I love this idea. I am going to have to give this a try for my son’s birthday party this year. These are all such fun ideas. So creative too! This is a great idea! Pinning for later. 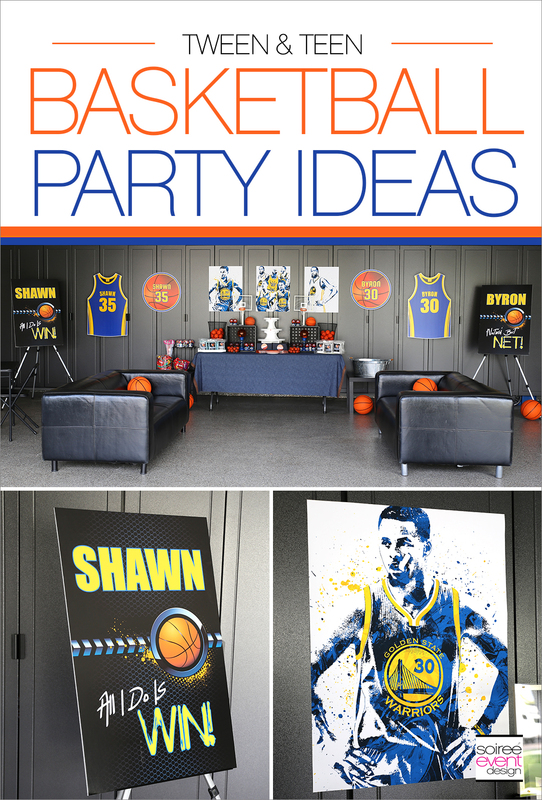 Now these are some amazing ideas for a basketball party. I can imagine it going down perfectly with some little fans! This would be such a fun party idea for kids! Basketball is one of those sports that can be loved by all. Okay, I just have to say, what a fantastic way to read your GARAGE for a party!!! So creative! What a great idea to make a little space for your teens/tweens to enjoy! Our boys would love this idea. I’ve been thinking of doing something like this in the garage for them. I love the basket ball theme! I think this can also work as an adults party, just replace the soft drink options for alcohol and some punch. My nephew would love this party. I love all the attention to details. Nothing was overlooked. Wow! This is a great idea for my tween nephews upcoming birthday. He love Montreal Canadiennes hockey team. We will use this idea for sure! This basketball party is so cool. My little brother would love it. Thanks for sharing. Wow what a room! A true basketball lover’s idea of heaven I can imagine!